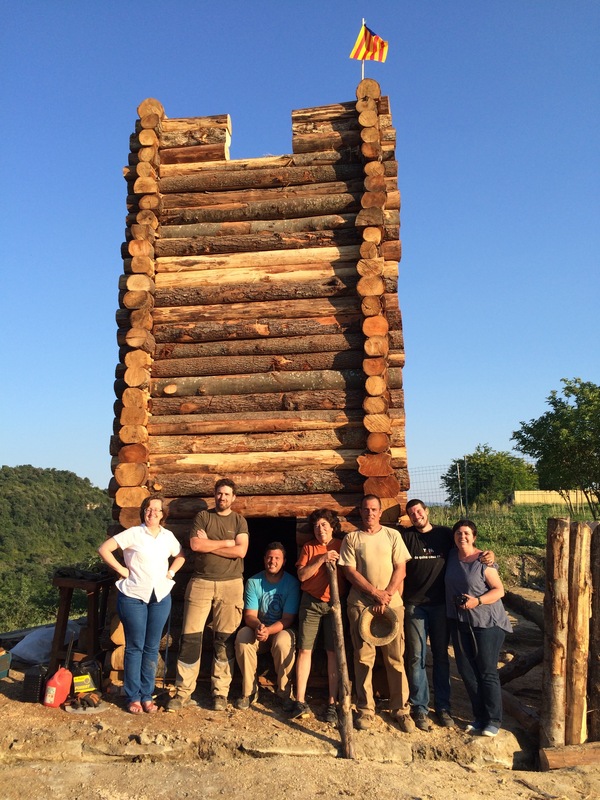 During fifteen days of June 2015, the team of l’Esquerda worked in a research project to build a Carolingian wooden watchtower on the River Ter, in Roda de Ter, Catalonia, Spain (This Research Project was approved and granted by the Spanish Ministry of Culture (DGICYT, HAR2012-36497) for three years 2013-2015.). 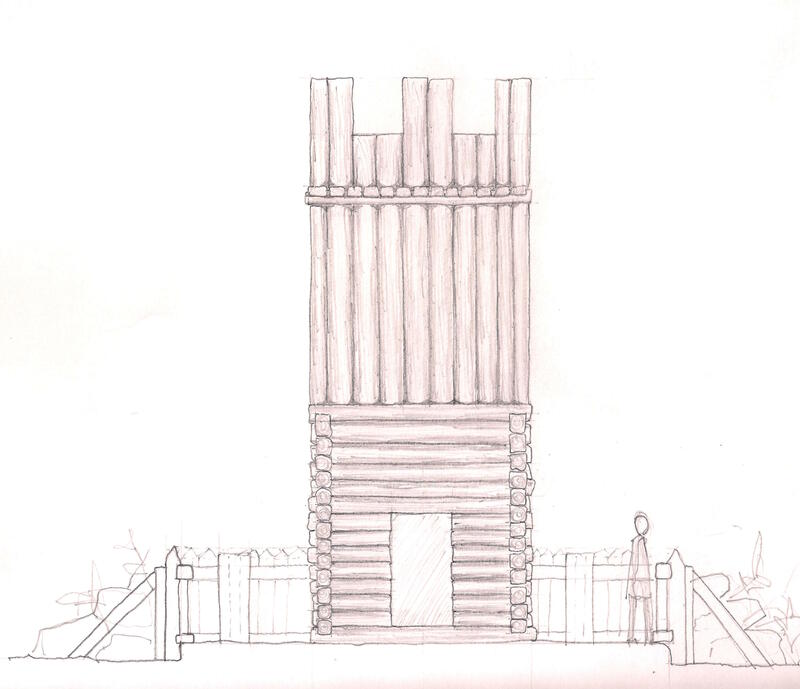 The idea was to test our hypotheses experimentally, (a) if the wooden watchtower could be built without any metal nail, (b) how it worked, and (c) its resilience. A second research objective of this building is to examine its durability as a structure. Therefore, we have attempted tot control its stabilisation and degradation. Since its construction, the tower has been monitored by a wood humidity analysis, visual fracture and deterioration inspection that allows us to ensure that the tower remains structurally stable, since its initial construction two and half years ago. The fall of the Roman Empire in the north-eastern Hispanic region created a series of ramifications that affected the behaviour of the area. These changes occurred between the 5th and 10th centuries AD, in a poorly documented period of the Middle Ages – namely the ‘Dark Ages’, that would lead to the feudal period of 11-12th centuries. In this ‘dark’ period, many important events occurred during the formation of the Carolingian Empire, centering on the reconstruction of the ancient Roman Empire from a Germanic perspective - the formation of the Visigoth kingdoms, the Muslim invasion, and the formation of central Europe. There is a paucity of information (documents and archaeology) concerning these events in Catalonia. Nevertheless, in recent years, various research projects are giving a new light to this important period. The work we present herein is included in this challenge. One of the most important points in the creation of the Carolingian Empire was the border control, for which they created some “empty” territories in various locations - the Marks. These were very dangerous territories where the real frontier between the enemy populations was experienced; the southern Carolingian Mark, the Marca Hispanica, was the boundary with the Muslims of al-Andalus. This mark was established southwards to the Pyrenean Mountains, in the northern part of Catalonia. After the Carolingian conquest of Barcelona in AD 801, the frontier of the Marca Hispanica was established in the River Llobregat; however, there was an earlier frontier established during the late 8th century along the River Ter. This early frontier crossed the Plane of Vic and it defended the city of Girona, given to the franks in AD 785, and had an important role in the conquest of Barcelona. During this early frontier, the place of Roda Civitas, as Carolingian documents refer to it, appears to be a central place. Recent discoveries at the site of l’Esquerda, especially the 150 m long wall, date to the Visigoth period and re-occupation by the Carolingian army, demonstrating that this site was in fact the Roda Civitas named by high-medieval documents. 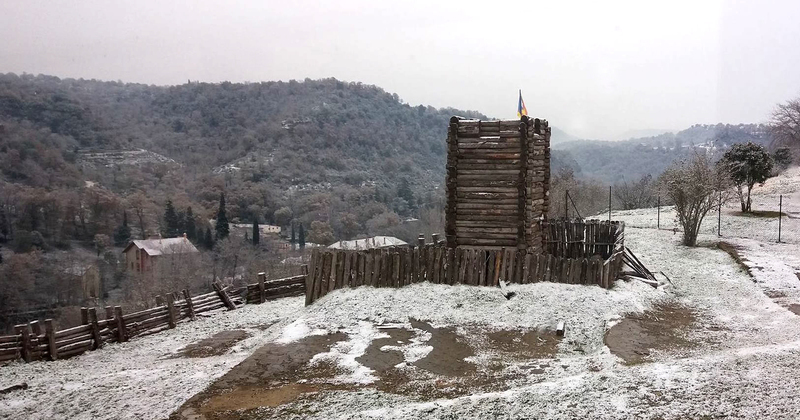 To control the border, Carolingians occupied and rebuilt the ancient fortress of l’Esquerda, and archaeological evidence in the form of post holes and rock cuts indicates the presence of wooden watchtowers, in some hill tops along the River Ter. L’Esquerda is an archaeological site placed on a peninsula over the River Ter in the northeast of the Plana de Vic. The area (12 Ha), is strongly defended by its natural cliffs over the river, except at its northern face, where artificial defences were built. The site has a strategic value because it controls the Plana de Vic and all the mountains around, and it is a crucial point in the communication net to the coast. This site has been occupied over several periods, probably due to its excellent location. The earliest occupation phase dates to the 8-7th century BC, in the transition between the Late Bronze Age and Early Iron Age (Phase 1). During this period, the site was a village with round huts. This village expanded during the Early Iron Age and during the Early Iberian period (7-5 centuries BC; Phase 2). The houses became square and rectangular, and the clay was combined with some stone walls. Among the materials, the Greek imports from the coast are the most significant artefacts found. At the end of 5th century BC, the site became a larger settlement (an oppidum), with massive fortifications, planned urbanism, an artisanal quarter, commercial evidence, and a sanctuary (Phase 3). During this period, l’Esquerda may be considered a capital for the Ausetani, the Iberian tribe of the region. These Ausetani often appear in the Greek and Roman texts talking about the Punic War II and the conflict with the Carthaginians at the end of 3rd century BC, or during different uprisings after the Roman conquest, in the early 2nd century. In this period, some stronger defences were added to the Iberian fortification (Phase 4) and all the Iberian walls were demolished after the Roman victory. After the defeat, l’Esquerda continued as a village during the Roman-republican period (2nd-1st centuries BC), but it was abandoned at the end of 1st century BC, when Roman Auso was founded in Vic, just 5 Km away in the centre of the plain (phase 5). L’Esquerda was not occupied again until the end of the Late Empire (5th-6th centuries AD), after which it became the Visigoth Roda Civitas (Phase 6). In this phase, new defences were built upon the ruins of the ancient oppidum wall. Associated with Phase 6 is a great pit field and an extramural cemetery. Carolingians settled down in l’Esquerda during the last 8th century AD (Phase 7). They remodelled the Visigothic wall by building some stone towers thereby making the defences more effective. 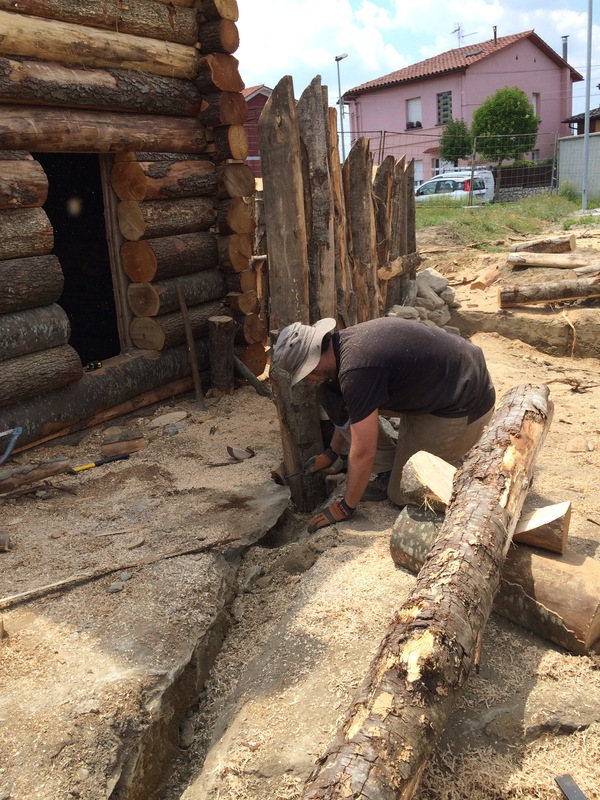 Also some evidence of the wooden watchtowers have been found in and around the site. A silver Carolingian coin and some Carolingian spatulated ware confirm the importance of the site in the Carolingian period. In AD 826, this site was destroyed by Ayssun, according to the Annales Regni Francorum, and, apparently, the archaeological evidence. After the reestablishment of the county of Osona, at the end of 10th century AD, l’Esquerda became a rural village around the pre-Romanesque parish church of Saint Peter (Phase 8). The site grew from the 10th to 13th centuries with a Romanesque church (Phase 9). The decline of the village started in the mid-13th century, when people moved next to the river at the new town of Roda de Ter. In 1314, in the context of feudal fights, l’Esquerda was destroyed, and not occupied thereafter (Phase 10). Recent archaeological excavations in l’Esquerda have been focused upon the Visigoth and Carolingian settlements. The most significant artefact is the big stone wall, built in front of the ruined Iberian walls using the same stones of the old fortification and rising in some points. This resulted in a linear wall almost 150 m long and 2.70 m wide (9 Carolingian Feet). Its height ranges between 4 and 5 m. Analyses of the joined stones show the mortar was made from lime. The outside stone face was plastered, and probably the upper part was made of earth. No entrance has been recognised from this period, but the entrance probably is located at the eastern or western part next to the cliffs. Further investigations are expected to clarify such details. Two further discoveries pertain to this powerful defensive structure, the first being an underground silo field at the inner side of the wall. At least 66 of the 125 structures found to date belong to the Visigoth period. Pits were used to store the grains and subsequently used as rubbish pits. The C14 analysis and material found verifies the chronology to around the 7th century. Thirteen burials were discovered during 2012-2013 excavations outside the external wall. These remains were buried within a simple grave dug in the ground and sometimes covered with stones. No items were buried with the deceased. The C14 chronology indicated these burials occurred at the end of the 7th century. These remains show that l’Esquerda was occupied, organised, and defended during Visigoth times and that the Roda Civitas named by Carolingian documents corresponds to this site. The Carolingian evidence in l’Esquerda confirms the identity of Roda Civitas. During this period, the wall was reinforced by towers attached side to side to the main wall. Three towers have been identified to date and there appears to be evidence of an additional two. The distance between each tower corresponds to 90 Carolingian feet, a poliorcetic Carolingian measurement. In the 2014 excavations, a secondary gate and an access ramp defended from tower n. 5 was identified, which in its early phase could correspond to a Carolingian reform of the defensive structures of Roda Civitas. The archaeological materials undoubtedly belonging to the Carolingian period confirm the importance of this period. Many sherds of fine Carolingian pottery were recovered inside and around the towers. These sherds were made in imitation of the old Roman Terra Sigillata and appear to be manufactured near the River Rhine. Further important evidence, was the finding of a silver denarius coin of Louis the Pious, son of Charlemagne, emperor between 814 and 840. This coin, with the legend “+HLUDOVVICUS IMP” in the obverse and “+XPISTIANA RELIGIO” in the reverse, is an extraordinary artefact. It belongs to the typology called “denier à la légende chrétienne” that was used in the frontier zones of the Empire, including the Marca Hispanica. Located at the top of the peninsula, south of the church, some rock carvings were found. 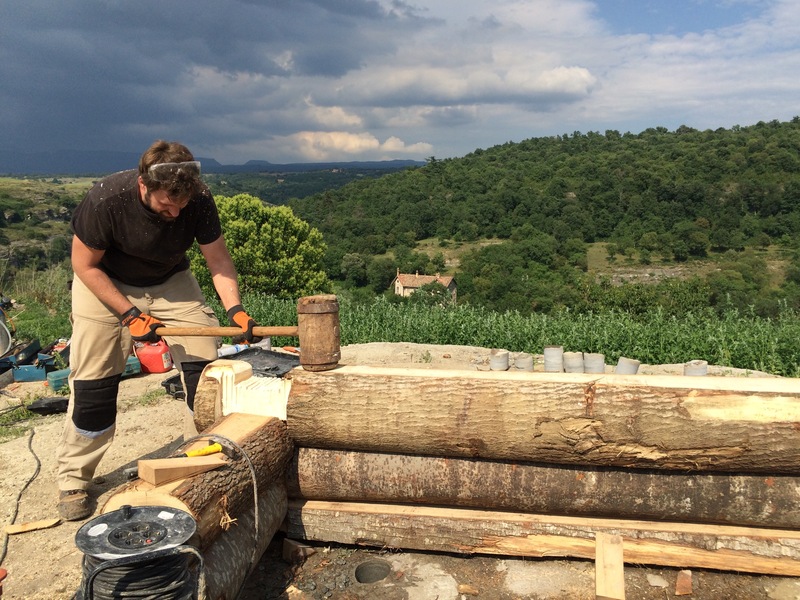 They were identified as the base of a timberbuilt Carolingian watchtower. 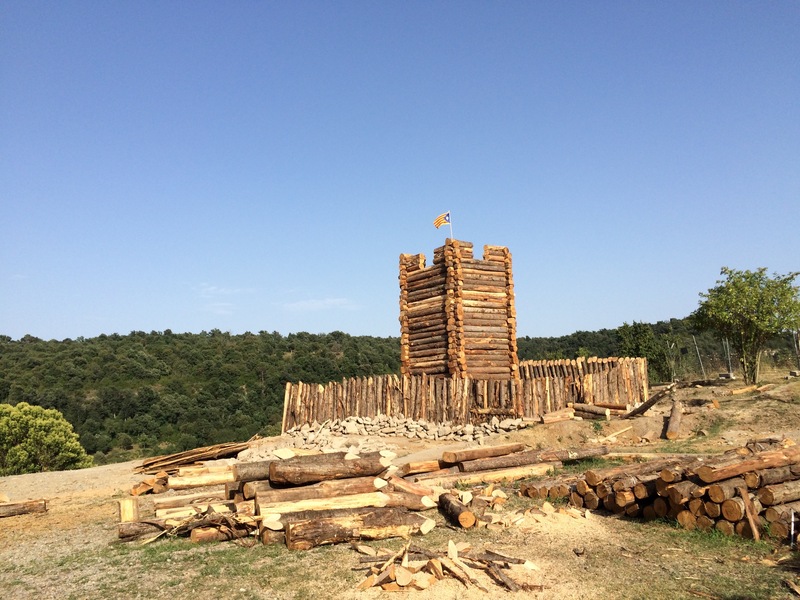 Moreover, the surveying works of the landscape surrounding l’Esquerda have identified evidence of elevated wooden towers such as: in la Roca del Purpiol, Savasona Hill, Savellana Castle, and in Torelló Castle. The evidence of these structures led to a hypothesis about how these watch towers were built and persisted in the soil. Also 9th century medieval iconography shows us such a model of a wooden tower. These, together with other remains, such as the postholes in the site and around the territory, have been used during archaeological research of these defensive structures. The archaeological traces found on several sites around Osona Shire, like other examples previously mentioned, allowed us to see that these constructions were raised on elevated rock platforms near the river (like other Carolingian fortified borders). Thus, we selected a construction zone on the elevated rock platform over the River Ter adjacent to the new Archaeological Museum of l’Esquerda. The construction of the watch tower was primarily an experimental process. 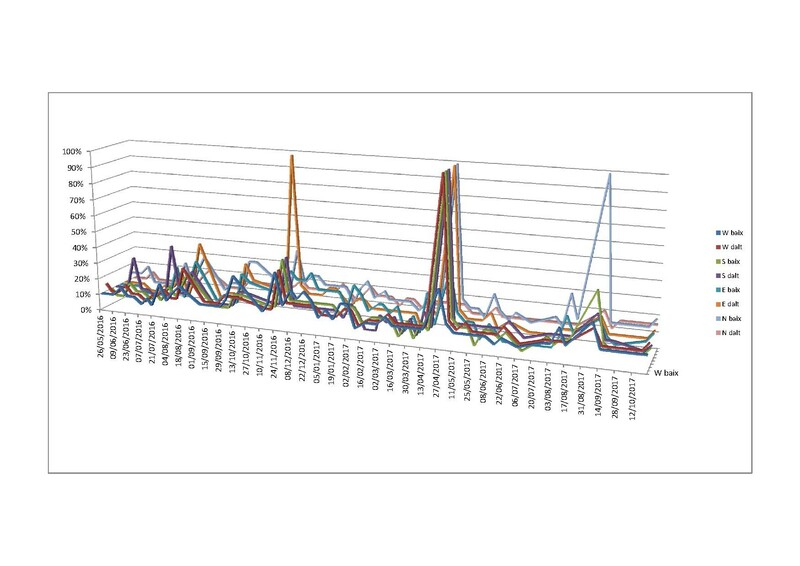 The humidity and monitoring of the degradation progress was also recorded. 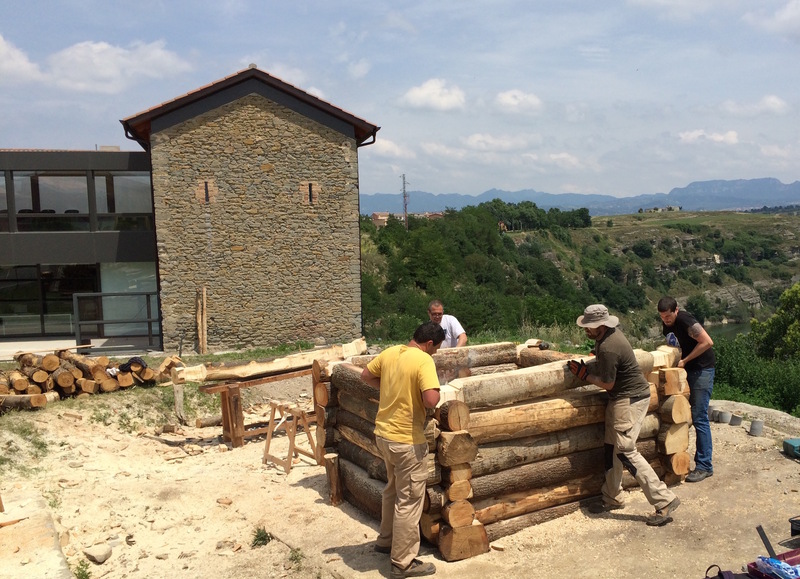 For the construction of the tower we used only the wood species identified from the archaeobotanic analysis of l’Esquerda site samples of carbonized seeds and woods from excavation. These species were: Maple (Acer campestre), Chestnut tree (Castania sativa), Cherry tree (Prunus avium), Beech (Fagus sylvatica), Ash (Fraxinus excelsior), Oak (Quercus sp. ), Poplar (Populus tremula), Alder tree (Alnus glutionsa) and Black poplar (Populous nigra). 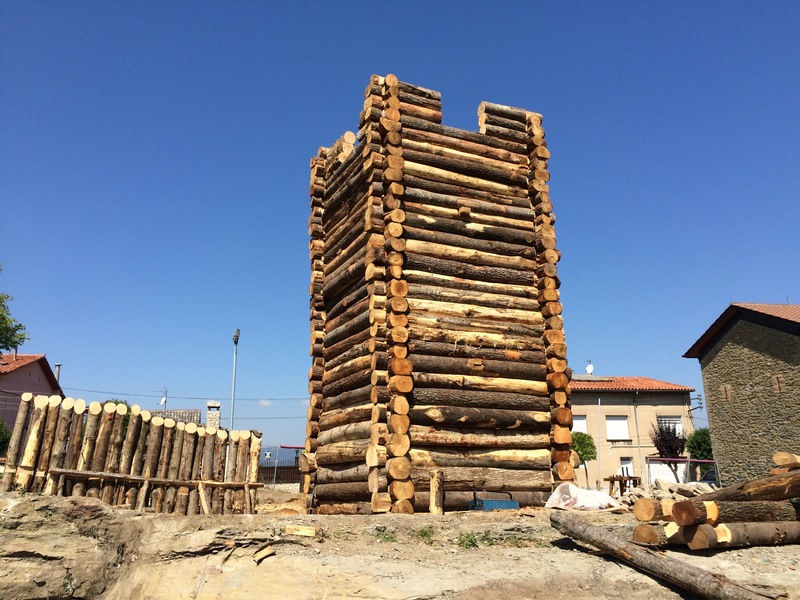 The trees used in the experimental tower construction had been cut from an ecological forest by a specialised company who then delivered the wood. We used fresh wood, like Carolingian army probably did when they arrive in a place and must construct watchtowers very quickly. The trunks were all cut at the same lenght, 9 Carolingian feet, easier to carry away and to build. 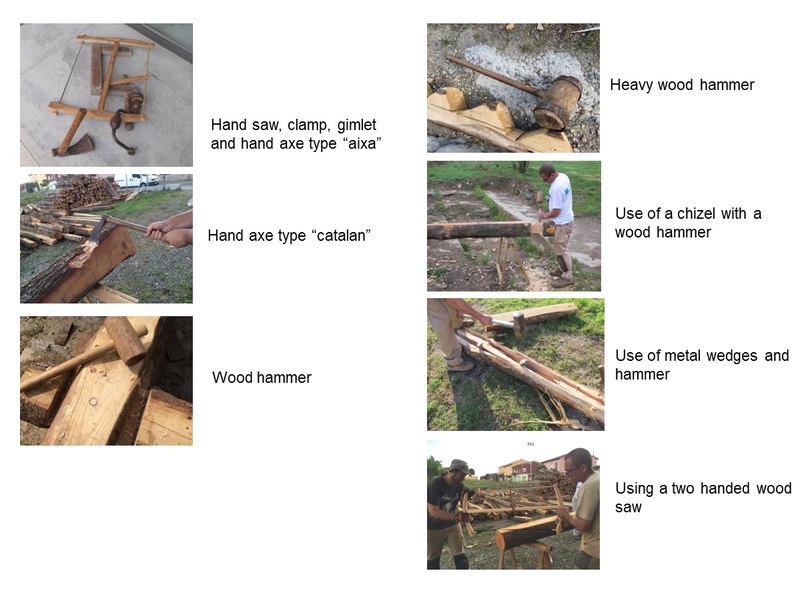 The construction was built by a team of four people, using traditional tools such as a hand saw, clamp, gimlet, Catalan type axe, wood hammer, chisel, two-handed wood saw, heavy wood hammer and metal wedges. In the construction planning phase, we cleaned the rock soil of all superior sediments. This allowed us to see and use the rock diaclases like in real sites and we began to elevate the structure. The soil was conditioned to preserve the trunks from rain and humidity, thus constructing directly over the bare rock. The trunks were placed and levelled out horizontally over the rock, forming a squared shape basement to allow the tower to be raised. To avoid the structure’s lateral displacement some posts were introduced in postholes to stabilise the entire construction. 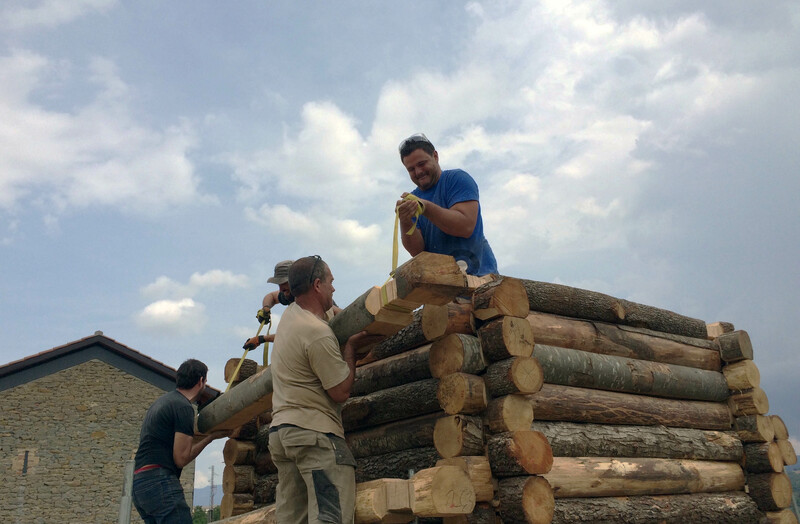 To ensure a level base and therefore a straight upright tower, we placed the wood with the widest diameter on the deepest side, measuring and adjusting the inclination with a waterlevel. The architectural plans of construction were followed, cutting the wood with axes to fit one with the other without the use of nails. Once the base was level, we carvered the postholes in the rock using hammer, slope and wedges. These postholes do not support the whole structure, but rather the posts placed into them to prevent the lateral or twist movements of the structure when the wood is drying. Following the features observed archaeologically at l’Esquerda, two different postholes types were made: 10 of 8 cm diameter X 15 cm depth with a working time of 1 hour and eight holes of 16 cm diameter X 20 cm depth with a working time of 2 hours minimum. In total, it took 26-30 hours to drill the holes in the rock. In the next step, several people carried the cut trunks which were hammered securing one to the other. Ropes and our strength were used to raise the trunks to the higher levels within and outside of the structure. Then we used a heavy woodhammer to wedge the trunks together. 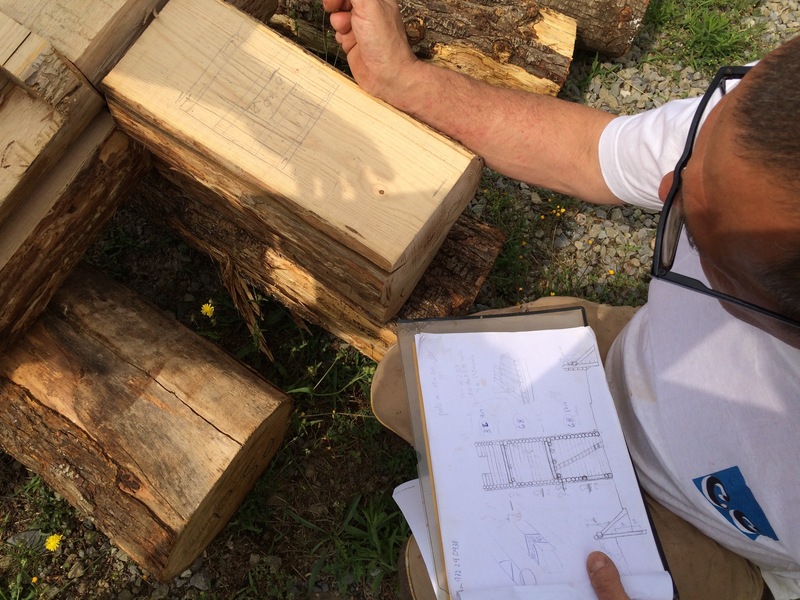 As progress was made, our plans were adapted: the inner ladder, thought to be constructed with two vertical trunks and several horizontal steps, was replaced by a simple model. A single trunk was placed diagonally with the steps cut in it. This decreased the construction time and also use of materials. The floors, thought to be of uncut wood, were replaced by thick planks cut from the wood. 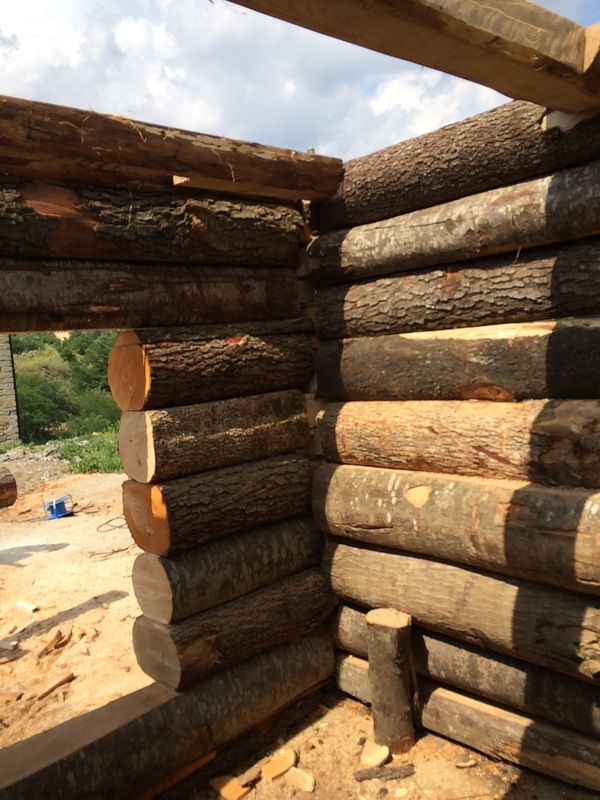 Although this meant less wood cost and increased comfort, it increased the cutting time. 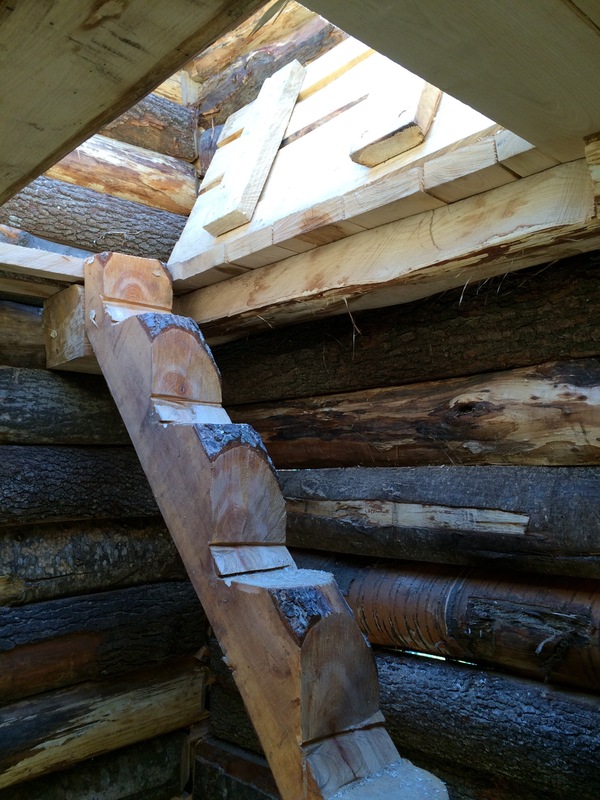 The wooden planks were held together by three beams in each floor, fixed with wood spikes. As we raised to the desired height (two floors 7,5 m) we proceeded to cut the crenels on the top of the tower. But how many and how wide did these have to be? We could see depicted in Saint Peter’s Roda Bible a wooden tower with crenels, but the solution came from experimentation: we took a bow and measured the space that the archer needs to work the bow. The result was a single space crenel of about 3 Carolingian feet. The outer palisade was raised using the rock diaclases, similar to the real sites. We fitted the trunks into the diaclase, holding one trunk with the other by cutting a transversal inner rail to mount the structure that the drilled postholes supports. This palisade was reinforced with stone blocks and earth from the outer side. Table 1 displays some of the measurements of the tower, as of its completion in June 2015, while Table 2 shows time taken to dril postholes, linked directly to the final man hours of Table 3. Once the experimental watchtower was constructed we began to make some controls about its stability, inclination, and effects of humidity and fungi growth in wood deterioration. These controls are made once a month. The control of humidity allow us to know the effects of sun, rain and snow along the year. The graphic shows the results from June 2016 until October 2017. Two picks can be clearly seen on it, one in December 2016, with the maximum of humidity corresponding to some snow and rain acumulated in early winter, and the other one in April 2017 due to the spring rain. The snow affected especially the high north face of the tower (N dalt), while the spring rain affected the tower’s whole faces (N-S-E-W) from high to down (dalt-baix). 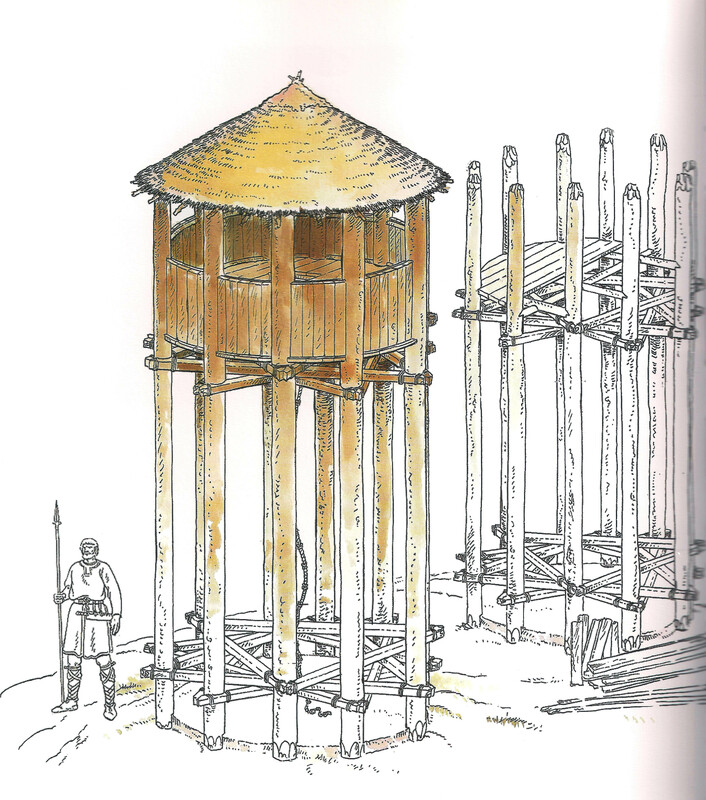 The main objective to build a wooden watchtower upon the River Ter was the construction process itself, to assess if it was possible to make it, by following the archaeological remains found in the site, and using ancient technology. Also, it was key to discover how many people were necessary to build it, and how much time it would take for such a team to complete it. The construction of the watch tower was made using fitted cut trunks of fresh wood assembled with a very heavy woodhammer. No metal nails or spikes were used in the building, because they were not found during excavation. 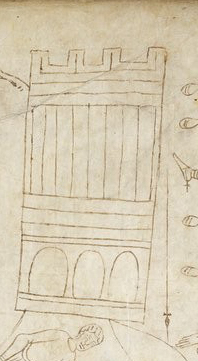 This construction reproduced a watch tower which could be used at the Carolingian border, just as the late Roman and High Medieval iconography depicts. The most arduous job of the construction was the drilling of the post holes into solid bare rock in contrast to cutting and raising up the trunks to make the tower. To construct these towers, the Frankish army used standard measurements based on the measure of Carolingian Imperial Feet. 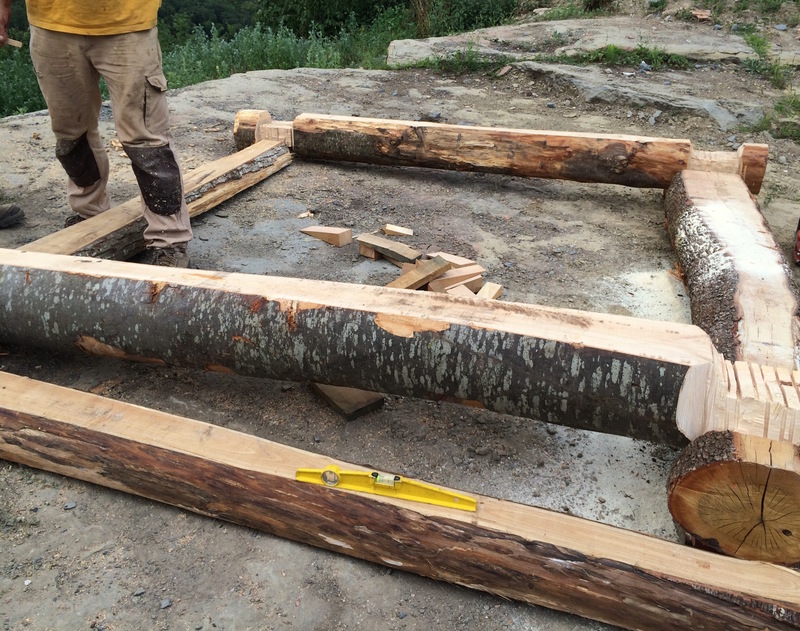 The trees were cut with the same length (4-8 feet) and transported to the construction site. The construction was probably made by Carolingian soldiers when the army arrived to a new place to control, using local trees and resources as well as using their own equipment like axes, probably supervised by a military engineer like the Roman legions. The tower could be raised very quickly, in one week or less, depending on the man day effort and the specialisation of builders. Our experiment took place during two weeks by four non-specialised wooden tower constructors (only one of them was a carpenter), with the assistance of other people when required. It stands to reason that this kind of tower does not have any defensive purpose. 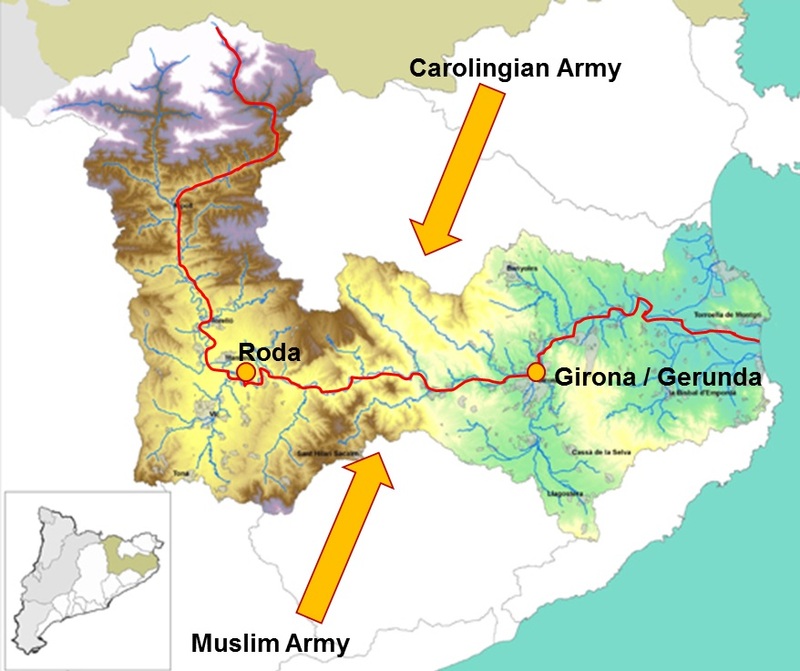 Its function is as an outpost, to observe the enemy movements, for notifying and transmitting messages along the outposts along the River Ter up to the main military Carolingian bases like Gerunda / Girona. A second research objective of this building is to examine its durability as a structure. Therefore, we have attempted tot control its stabilisation and degradation. Since its construction, the tower has been monitored by a wood humidity analysis, visual fracture and deterioration inspection that allows us to ensure that the tower remains structurally stable, since its initial construction two and half years ago. Some trunks have exhibited natural drying fractures and loose bark, with the appearance of some fungi and insect nests and burrows. Obviously, there have been weather effects on the construction. In our case, the north face is the most shaded and wet but also it is the most stable in temperature and humidity percentage. The rest of the faces are strongly exposed to the variable meteorological effects and annual seasons. Once we know these factors, the future plan for this research is to open the tower to scholars and little groups of visits. Currently, the tower can be seen from outside, but in one or two years, when we are sure that the tower is stable and safe, we intend to open it for visits, and ascent to the highest vantage points. Its situation near the Archaeological Museum of l’Esquerda, also allows us to use it to explain Carolingian times from the Museum’s perspective. We are preparing a little exercise book for scholars to work on after their visit. 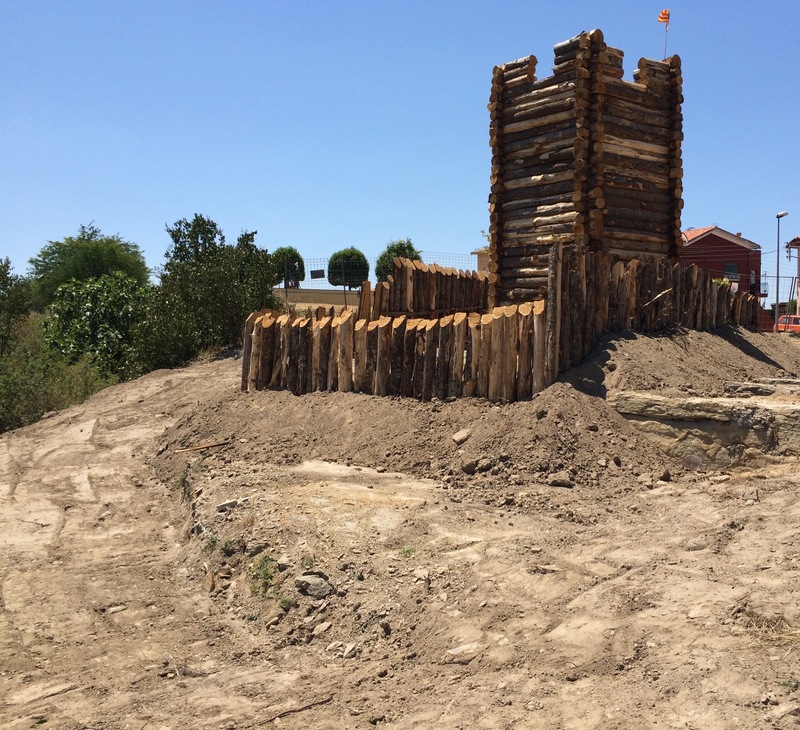 Some space around the tower will also be used to play, show and work in experimental archaeology for students and general public. The building process was documented and recorded by video and photography. An example of this video can be seen here. A photogrammetry study was made by Bruno Parés to facilitate a 3D copy of the real tower to aid in explanations of the construction of this tower. It can be viewed via this YouTube link. Ollich, I., de Rocafiguera, M. and Serrat, D., 2014. 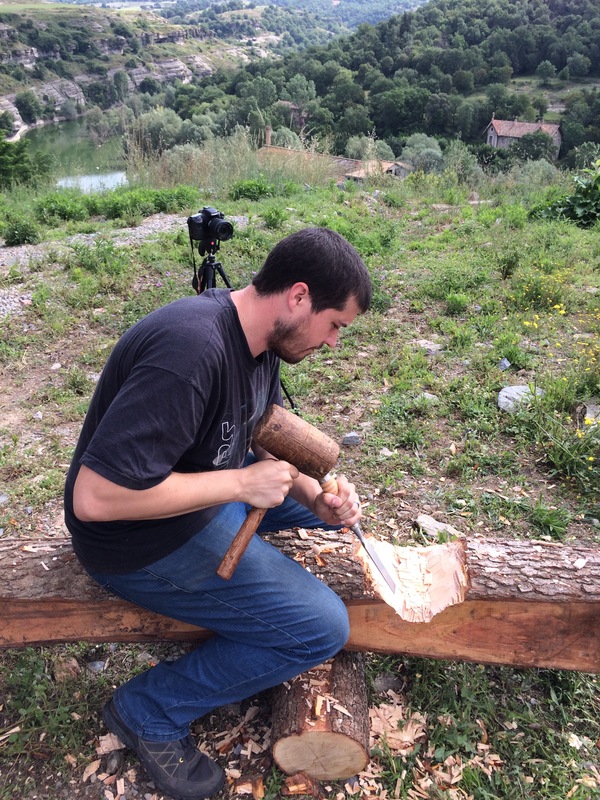 The Origins of Experimental Archaeology in Catalonia. The Experimental Area of l’Esquerda. In: J. Reeves Flores & R. Paardekooper, eds, Experiments Past. Leiden: Sidestone Press. pp.205-214. Ollich-Castanyer, I., de Rocafiguera-Espona, M. and Ocaña-Subirana, M., 2016. 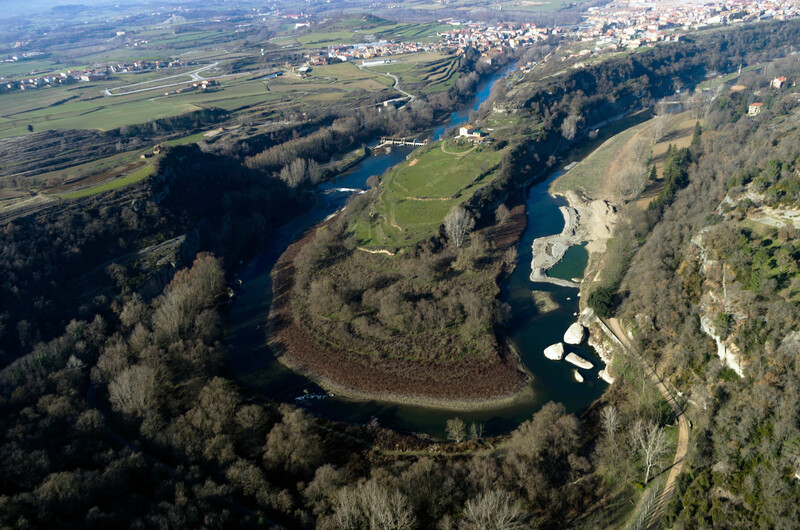 The Southern Carolingian Frontier in Marca Hispanica along the River Ter: Roda Civitas and the Archaeological Site of l’Esquerda (Catalonia). In: N. Christie and H. Herold, eds. Fortified Settlements in Early Medieval Europe. Defended Communities of the 8th-10th Centuries. Oxford: Oxbow Books. pp.205-217.